The 2016 New England Patriots season is the franchise's 47th season in the National Football League, the 57th overall and the 17th under head coach Bill Belichick. The Patriots will attempt to win their 8th consecutive AFC East title as well as a fifth Super Bowl championship. The Patriots became the first team that originated from the American Football League to reach 500 franchise wins, regular-season and playoffs, with their Week 12 win over the New York Jets; they entered the season with 491 wins. Patriots starting quarterback Tom Brady was suspended for the first four games of the season due to his alleged role in the Deflategate scandal. Under backup quarterbacks Jimmy Garoppolo and Jacoby Brissett, the team went 3–1 during Brady's suspension. Bill Belichick achieved the record of 4th-most wins as a head coach during the season. Two-time Pro Bowl linebacker and 2008 AP NFL Defensive Rookie of the Year Jerod Mayo announced his retirement in February 2016. Linebacker Dane Fletcher also retired. In March, the Patriots released wide receiver Brandon LaFell and tight end Scott Chandler. The Patriots subsequently traded Pro Bowl defensive end Chandler Jones to the Arizona Cardinals in exchange for guard Jonathan Cooper and a 2016 second-round draft pick. Days later the Patriots acquired tight end Martellus Bennett from the Chicago Bears via trade. The Patriots forfeited their first-round selection as part of the punishment for the team's Deflategate scandal. The team will also forfeit a 2017 fourth-round selection. The Patriots traded defensive end Chandler Jones to the Arizona Cardinals in exchange for guard Jonathan Cooper and Arizona's second-round selection (No. 61 overall). The Patriots traded their fourth-round selection (No. 127 overall) to the Chicago Bears in exchange for a sixth-round selection (No. 204 overall) and tight end Martellus Bennett. NE – Chris Hogan 37-yard pass from Jimmy Garoppolo (Stephen Gostkowski kick), 7:34. Patriots 7–0. Drive: 8 plays, 74 yards, 4:13. NE – Stephen Gostkowski 47-yard field goal, 1:00. Patriots 10–0. Drive: 12 plays, 63 yards, 5:12. ARI – Larry Fitzgerald 3-yard pass from Carson Palmer (Chandler Catanzaro kick), 4:06. Patriots 10–7. Drive: 11 plays, 54 yards, 6:20. NE – LeGarrette Blount 8-yard run (Stephen Gostkowski kick), 10:00. Patriots 17–7. Drive: 9 plays, 75 yards, 5:00. ARI – David Johnson 1-yard run (Chandler Catanzaro kick), 4:29. Patriots 17–14. Drive: 5 plays, 33 yards, 1:51. NE – Stephen Gostkowski 53-yard field goal, 12:35. Patriots 20–14. Drive: 11 plays, 40 yards, 6:54. ARI – Larry Fitzgerald 1-yard pass from Carson Palmer (Chandler Catanzaro kick), 9:46. Cardinals 20–21. Drive: 7 plays, 79 yards, 2:49. NE – Stephen Gostkowski 32-yard field goal, 3:44. Patriots 23–21. Drive: 13 plays, 61 yards, 6:02. The New England Patriots enter their first game of the 2016 NFL season against the Arizona Cardinals with starting QB Jimmy Garoppolo replacing Tom Brady who was currently serving his four-game suspension. The match finished with a score of 23–21 giving the Patriots their first win of the season. NE – Danny Amendola 12-yard pass from Jimmy Garoppolo (Stephen Gostkowski kick), 10:53. Patriots 7–0. Drive: 8 plays, 75 yards, 4:07. NE – Martellus Bennett 20-yard pass from Jimmy Garoppolo (Stephen Gostkowski kick), 6:22. Patriots 14–0. Drive: 7 plays, 75 yards, 3:10. NE – Danny Amendola 10-yard pass from Jimmy Garoppolo (Stephen Gostkowski kick), 13:10. Patriots 21–0. Drive: 12 plays, 76 yards, 6:21. NE – Stephen Gostkowski 34-yard field goal, 2:48. Patriots 24–0. Drive 9 plays, 36 yards, 3:01. MIA – Andrew Franks 27-yard field goal, 0:00. Patriots 24–3. Drive 9 plays, 77 yards, 0:58. MIA – Kenny Stills 24-yard pass from Ryan Tannehill (Andrew Franks kick), 5:45. Patriots 31–10. Drive: 7 plays, 75 yards, 2:59. MIA – Jordan Cameron 12-yard pass from Ryan Tannehill (Andrew Franks kick), 14:51. Patriots 31–17. Drive: 5 plays, 88 yards, 4:43. The Patriots home opener began as they surged to a 24–0 lead behind three touchdowns by Jimmy Garoppolo, but with 4:57 to go in the second quarter Garoppolo was driven to the ground by Kiko Alonso on a completion to Malcolm Mitchell and Garoppolo suffered a shoulder injury that required transportation to Massachusetts General Hospital; he finished with 232 yards and three touchdowns. Rookie Jacoby Brissett finished the game, completing six of nine passes for 92 yards while LeGarrette Blount rushed for 123 yards and a touchdown. Despite trailing 31–3 Ryan Tannehill stormed back with 387 yards and two touchdowns. The Patriots drove forward in the final six minutes but Stephen Gostkowski missed a 39-yard field goal attempt with one minute to go. The Dolphins raced to the Patriots 20, but Tannehill was intercepted in the endzone by Duron Harmon. The game finished with a score of 31–24 with the Patriots adding another victory to improve to a record of 2–0. NE – LeGarrette Blount 41-yard run (Stephen Gostkowski kick), 11:00. Patriots 27–0. Drive: 2 plays, 47 yards, 0:40. 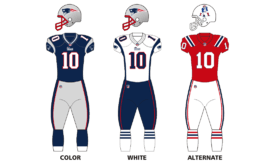 During the match, the Patriots wore Color Rush uniforms that have their traditional colors on them. With Tom Brady still in his third game of suspension and Jimmy Garoppolo injured, the Patriots started their backup quarterback Jacoby Brissett. The Patriots defense manage to prevent the Houston Texans from scoring a single point throughout the match. However, unlike the Texans, the Patriots scored 27 points, with three rushing touchdowns and two field goals. The Patriots improved to a record of 3–0. BUF – LeSean McCoy 7-yard pass from Tyrod Taylor (Dan Carpenter kick), 5:31. Bills 7–0. Drive: 12 plays, 65 yards, 7:11. BUF – Dan Carpenter 34-yard field goal, 14:49. Bills 10–0. Drive: 10 plays, 52 yards, 3:58. BUF – Dan Carpenter 43-yard field goal, 7:46. Bills 13–0. Drive: 12 plays, 74 yards, 4:40. BUF – Dan Carpenter 44-yard field goal, 0:28. Bills 16–0. Drive: 11 plays, 44 yards, 4:27. The Patriots stay at home for a matchup against the Tyrod Taylor-led Bills. The Patriots however could not find the end zone nor field goals dropping the Pats to a record of 3–1. This was the first shutout for the Patriots at home since 1993, as well as their first shutout loss since 2006. This was also the team's first shut out loss to the Bills since 2003. NE – LeGarrette Blount 1-yard run (Stephen Gostkowski kick), 10:28. Patriots 7–0. Drive: 8 plays, 80 yards, 3:13. CLE – Andrew Hawkins 11-yard pass from Cody Kessler (Cody Parkey kick), 6:09. Tied 7–7. Drive: 9 plays, 75 yards, 4:19. NE – Martellus Bennett 7-yard pass from Tom Brady (Stephen Gostkowski kick), 2:06. Patriots 14–7. Drive: 8 plays, 75 yards, 4:03. NE – Cody Kessler fumble out of bounds in end zone for a safety, 1:20. Patriots 16–7. NE – Martellus Bennett 5 -yard pass from Tom Brady (Stephen Gostkowski kick), 12:10. Patriots 23–7. Drive: 8 plays, 64 yards, 4:10. NE – Martellus Bennett 37-yard pass from Tom Brady (Stpehen Gostkowski kick), 12:24. Patriots 30–7. Drive: 8 plays, 75 yards, 2:36. CLE – Connor Hamlett 17-yard pass from Charlie Whitehurst (pass failed), 14:05. Patriots 30–13. Drive 7 plays, 80 yards, 3:22. NE – Stephen Gostkowski 31-yard field goal, 7:42. Patriots 33–13. Drive 11 plays, 72 yards, 6:23. With the four-game suspension of Tom Brady over, the Patriots started Brady against the Cleveland Browns. Once the match was finished with a score of 33–13, the Patriots improved to a record of 4–1. Tom Brady also obtained his 8th 400+ passing yard game of his career. NE – Stephen Gostkowski 46-yard field goal, 12:06. Patriots 3–0. Drive: 8 plays, 47 yards, 2:54. CIN – Andy Dalton 2-yard run (Mike Nugent kick), 3:10. Bengals 7–3. Drive: 7 plays, 60 yards, 3:26. NE – James White 15-yard pass from Tom Brady (Stephen Gostkowski kick), 1:01. Patriots 10–7. Drive: 8 plays, 75 yards, 2:09. CIN – Brandon LaFell 5-yard pass from Andy Dalton (Mike Nugent kick), 11:14. Bengals 14–10. Drive: 9 plays, 80 yards, 3:46. NE – Andy Dalton sacked by Dont'a Hightower for a safety, 7:05. Bengals 14–12. NE – Rob Gronkowski 4-yard pass from Tom Brady (Stephen Gostkowski kick), 5:00. Patriots 19–14. Drive 5 plays, 68 yards, 2:05. NE – James White 4-yard pass from Tom Brady (kick failed, wide left), 2:58. Patriots 25–14. Drive 4 plays, 53 yards, 1:35. CIN – Mike Nugent 25-yard field goal, 12:34. Patriots 25–17. Drive 12 plays, 68 yards, 5:24. NE – Stephen Gostkowski 31-yard field goal, 6:04. Patriots 28–17. Drive 12 plays, 62 yards, 6:30. NE – LeGarrette Blount 1-yard run (Stephen Gostkowski kick), 0:57. Patriots 35–17. Drive 9 plays, 50 yards, 2:35. The Patriots faced the Bengals at home, their first meeting with Cincinnati since the "We're on to Cincinnati" game that marked their turning point in an eventual Super Bowl-winning season two years earlier. During the match, Tom Brady completed his 5,000th pass on a Rob Gronkowski catch for 38 yards; the completion put Brady fourth in all-time quarterback completions while Gronkowski also reached the 22nd game with at least 100 receiving yards in his career, tying Jackie Smith for third all-time by a tight end. Down 14–10 in the third quarter, the Patriots got a safety when Dont'a Hightower sacked Andy Dalton in his own endzone; for the rest of the game, the Patriots outscored the Bengals 23–3, to finish the game with a 35–17 score. The Patriots improved to 5–1. The win was the 496th in Patriots history. NE – James White 19-yard pass from Tom Brady (Stephen Gostkowski kick), 2:55. Patriots 7–0. Drive: 13 plays 80 yards, 7:23. NE – LeGarrette Blount 3-yard run (Stephen Gostkowski kick), 10:58. Patriots 14–0. Drive: 11 plays, 84 yards, 4:46. PIT – Darrius Heyward-Bey 14-yard pass from Landry Jones (Chris Boswell kick), 9:02. Patriots 14–7. Drive: 5 plays, 71 yards, 1:56. PIT – Chris Boswell 32-yard field goal, 0:02. Patriots 14–10. Drive: 10 plays, 66 yards, 1:45. PIT – Chris Boswell 46-yard field goal, 8:44. Patriots 14–13. Drive: 9 plays, 48 yards, 4:49. NE – Rob Gronkowski 32-yard pass from Tom Brady (kick failed, wide right), 6:19. Patriots 20–13. Drive: 5 plays, 75 yards, 2:25. PIT – Chris Boswell 44-yard field goal, 14:44. Patriots 20–16. Drive: 12 plays, 42 yards, 6:35. NE – LeGarrette Blount 5-yard run (Stephen Gostkowski kick), 11:44. Patriots 27–16. Drive: 6 plays, 75 yards, 3:00. In the match at Heinz Field, the Patriots face off against the Pittsburgh Steelers who started their backup QB Landry Jones as Ben Roethlisberger the starter for the Steelers was out with a knee injury. The Patriots were able to win the coin toss and they elected to receive in the second half. No points were scored during the first drives on either team. However, during the first drive of the Patriots, wide receiver Chris Hogan fumbled on a reception from Tom Brady. The Steelers tried to take advantage of the turnover but Landry Jones was intercepted in the end zone by Malcolm Butler who was defending Antonio Brown. With this turnover, the pats managed to score a touchdown in a 19 yard pass from Brady to James White. During the next Steelers possession, they did not score any points as they were forced to punt. During the start of the second quarter, the patriots scored another touchdown. Additionally, Stephen Gostkowski missed his second extra point of the season in the third quarter. After the second and third quarters, the 4th quarter began. During this time, the Patriots scored 7 points while the Seelers scored 3. The game ended with a score of 27–16 in the Patriots' favor; the Pats improved to 6–1. BUF – Dan Carpenter 23-yard field goal, 11:07. Bills 3–0. Drive: 10 plays, 70 yards, 3:55. NE – Danny Amendola 9-yard pass from Tom Brady (Stephen Gostkowski kick), 4:35. Patriots 7–3. Drive 14 plays, 70 yards, 6:30. NE – Chris Hogan 53-yard pass from Tom Brady (Stephen Gostkowski kick), 1:41. Patriots 14–3. Drive: 3 plays, 45 yards, 2:08. BUF – Mike Gillislee 3-yard run (Dan Carpenter kick), 6:26. Patriots 14–10. Drive: 5 plays, 59 yards, 2:14. NE – Rob Gronkowski 53-yard pass from Tom Brady (Stephen Gostkowski kick), 4:18. Patriots 21–10. Drive: 4 plays, 79 yards, 2:08. NE – Stephen Gostkowski 51-yard field goal, 0:03. Patriots 24–10. Drive: 5 plays, 28 yards, 0:27. NE – Julian Edelman 12-yard pass from Tom Brady (Stephen Gostkowski kick), 14:00. Patriots 31–10. Drive: 2 plays, 24 yards, 1:00. BUF – Tyrod Taylor 26-yard run (Dan Carpenter kick), 7:57. Patriots 31–17. Drive: 13 plays, 75 yards, 6:03. NE – LeGarrette Blount 1-yard run (Stephen Gostkowski kick), 7:10. Patriots 38–17. Drive: 12 plays, 75 yards, 4:52. NE – Stephen Gostkowski 32-yard field goal, 7:10. Patriots 41–17. Drive: 13 plays, 76 yards, 4:52. BUF – Jonathan Williams (EJ Manuel–Nick O'Leary pass), 0:33. Patriots 41–25. Drive: 6 plays, 66 yards, 1:56. In a rematch of their only loss so far this season, the Patriots faced the Buffalo Bills in a road game. The Bills scored a field goal on their first drive, but New England responded with two straight scoring drives to run up the score to 14–3, and never lost the lead. Tom Brady had 4 touchdown passes to 4 receivers (Danny Amendola, Chris Hogan, Rob Gronkowski and Julian Edelman) and LeGarette Blount added a running touchdown and Stephen Gostkowski a field goal for a final score of 41 to the Bills' 25. Heading into their bye week, the Patriots improved to 7–1, the best record in the AFC and the league. NE – LeGarrette Blount 1-yard run (Stephen Gostkowski kick), 10:19. Patriots 7–0. Drive: 9 plays, 75 yards, 4:41. SEA – Steven Hauschka 27-yard field goal, 7:10. Patriots 7–3. Drive: 8 plays, 52 yards, 3:09. SEA – Steven Hauschka 31-yard field goal, 1:33. Patriots 7–6. Drive: 10 plays, 66 yards, 4:13. SEA – Doug Baldwin 6-yard pass from Russell Wilson (kick blocked), 10:52. Seahawks 12–7. Drive: 10 plays, 65 yards, 4:10. NE – LeGarrette Blount 1-yard run (Stephen Gostkowski kick), 1:05. Patriots 14–12. Drive: 11 plays, 81 yards, 4:59. SEA – Doug baldwin 18-yard pass from Russell Wilson (Steven Hauschka kick), 0:06. Seahawks 19–14. Drive: 7 plays, 75, 0:50. NE – LeGarrette Blount 13-yard run (Stephen Gostkowski kick), 7:52. Patriots 21–19. Drive: 10 plays, 91 yards, 5:34. SEA – Steven Hauschka 41-yard field goal, 2:52. Seahawks 22–21. Drive: 9 plays, 52 yards, 5:00. NE – Stephen Gostkowski 30-yard field goal, 13:00. Patriots 24–22. Drive: 10 plays, 63 yards, 4:52. SEA – Steven Hauschka 23-yard field goal, 8:56. Seahawks 25–24. Drive: 8 plays, 58 yards, 4:04. SEA – Doug Baldwin 15-yard pass from Russell Wilson (pass failed), 4:24. Seahawks 31–24. Drive: 8 plays, 48 yards, 4:05. Coming off of their Week 9 bye, the Patriots hosted the Seattle Seahawks on Sunday Night Football in a rematch of Super Bowl XLIX. In the final drive of the Patriots, they were just stopped short at the 1 yard line by the Seahawks. This caused the Patriots to lose the game. At the end of the match, the Seahawks beat the Patriots with a score of 31–24. The Pats dropped to a record of 7–2, still first in the AFC as of week 10 in the 2016 NFL season. The Seahawks improved to a record of 6–2–1. NE – Julian Edelman 4-yard pass from Tom Brady (kick failed, wide right), 10:10. Patriots 6–0. Drive: 6 plays, 27 yards, 2:53. SF – Phil Dawson 33-yard field goal, 2:40. Patriots 6–3. Drive: 12 plays, 60 yards, 7:30. NE – James White 9-yard pass from Tom Brady (Stephen Gostkowski kick), 14:53. Patriots 13–3. Drive: 6 plays, 77 yards, 2:47. SF – Vance McDonald 18-yard pass from Colin Kaepernick (Phil Dawson kick), 4:56. Patriots 13–10. Drive: 8 plays, 92 yards, 4:17. NE – Danny Amendola 5-yard pass from Tom Brady (Stephen Gostkowski kick), 14:55. Patriots 20–10. Drive: 10 plays, 80 yards, 4:21. NE – Malcolm Mitchell 56-yard pass from Tom Brady (Stephen Gostkowski kick), 10:06. Patriots 27–10. Drive: 5 plays, 70 yards, 1:55. NE – Stephen Gostkowski 38-yard field goal, 6:11. Patriots 30–10. Drive: 8 plays, 50 yards, 3:04. SF – Shaun Draughn 13-yard pass from Colin Kaepernick (Phil Dawson kick), 2:06. Patriots 30–17. Drive: 12 plays, 75 yards, 4:05. After a disappointing loss to Seattle the Patriots traveled to Santa Clara, CA to face Tom Brady's childhood team, the San Francisco 49ers, who were on an eight-game losing streak. This was also the first time Brady played the 49ers in San Francisco, as he missed the Patriots' trip to Candlestick Park in 2008 as a result of an injury. The Patriots improved to 8–2. This was also Brady's 199th career win (regular season and postseason combined), tied with Brett Favre for second place. It was also the 499th win in franchise history. NYJ – Nick Folk 51-yard field goal, 10:29. Jets 3–0. Drive: 8 plays, 41 yards, 3:14. NYJ – Brandon Marshall 1-yard pass from Ryan Fitzpatrick (Nick Folk kick), 14:56. Jets 10–0. Drive: 9 plays, 79 yards, 4:46. NE – Stephen Gostkowski 28-yard field goal, 10:45. Jets 10–3. Drive: 10 plays, 65 yards, 4:11. NE – Malcolm Mitchell 4-yard pass from Tom Brady (Stephen Gostkowski kick), 6:29. Tied 10–10. Drive: 7 plays, 50 yards, 3:17. NE – Stephen Gostkowski 29-yard field goal, 7:34. Patriots 13–10. Drive: 12 plays, 58 yard, 5:21. NYJ – Quincy Enunwa 22-yard pass from Ryan Fitzpatrick (Nick Folk kick), 10:11. Jets 17–13. Drive: 8 plays, 73 yards, 4:32. NE – Stephen Gostkowski 41-yard field goal, 7:02. Jets 17–16. Drive: 8 plays, 53 yards, 3:15. NE – Malcolm Mitchell 8-yard pass from Tom Brady (pass failed), 1:56. Patriots 22–17. Drive: 9 plays, 83 yards, 3:08. With the win, the Patriots improved to 9-2. This was also the Patriots' 500th franchise win, as well as Tom Brady's 200th career win, tying him with Peyton Manning and surpassing Brett Favre who had 199 wins. In addition to this, Tom Brady also surpassed the 60,000 yards passing mark. The Patriots will host the Los Angles Rams, making this the fourth regular season meeting between the two teams since Super Bowl XXXVI. The Pats will not have Rob Gronkowski, who was placed on Injured Reserve the day before the game. ↑ "Tom Brady drops appeal, accepts four-game Deflategate suspension". bostonglobe.com. 2016-07-15. Retrieved 2016-09-28. ↑ Stites, Adam. "Bill Belichick now 4th all-time in wins for an NFL head coach". SBNation.com. Retrieved 2016-10-22. ↑ "Players pay tribute to Jerod Mayo after retirement news". Patriots.com. 2016-02-17. Retrieved 2016-04-08. ↑ "SOURCE: LB DANE FLETCHER CHOOSING TO RETIRE". WEEI 93.7 FM. 2016-03-09. Retrieved 2016-04-08. ↑ "Patriots release TE Scott Chandler and WR Brandon LaFell". Patriots.com. 2016-03-02. Retrieved 2016-04-08. ↑ "Patriots acquire G Jonathan Cooper and a 2016 second-round draft pick in a trade with Arizona for DE Chandler Jones". Patriots.com. 2016-03-15. Retrieved 2016-04-08. ↑ "Patriots acquire TE Martellus Bennett in a trade with Chicago". Patriots.com. 2016-03-17. Retrieved 2016-04-08.